Growing Chili Peppers Organically in hot, dry climates. Chili (including Bell) peppers belong to the family Solanaceae (nightshade), genus Capsicum (chilies), and originate in the Americas. A tropical perennial bush, chilies are normally grown as an annual in the United States. The word Chili comes from the Nahuatl language of the Aztecs meaning Capsicum fruit. Pepper is actually a misnomer because these plants are not related to the Black Pepper of India nor the Szechuan Pepper of Asia. Chilies were first introduced to Asia by the Portuguese after the year 1500 and have become a standard part of the diet. Some of their appeal is that the capsaicin heat in the chilies is anti-microbial, killing bacteria by the millions and making food without refrigeration safer to eat. There are five domesticated and 23 wild chili species. Three species are most common in North American grocery stores. Capsicum annuum (a perennial south of the United States) is the most widely domesticated and includes nearly all familiar varieties, among them Bell and Jalapeno. Capsicum chinense (originating in the Amazon basin) includes Habanero and its even hotter cousins. Capsicum frutescens is found in Tabasco sauce. Other species are increasingly available to the home gardener. The leaves and stems of all Chili plants are poisonous. At a nursery, choose large, robust seedlings that do not yet have fruit. While seedlings without blossoms are often recommended as the best choice, plants with blossoms but no fruit are okay as long as you snip off the blossoms as soon as you get home. The plant should still be in a growth mode and not switched to fruit production mode. 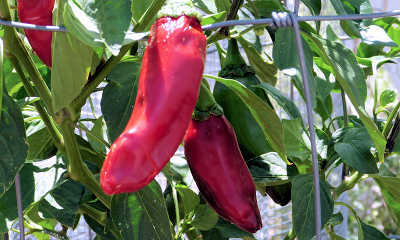 If Bell-type peppers are desired, consider the smaller pod 'Carmen Sweet Pepper' which is prolific in high temperatures. Like Bells, Carmens have no heat. Bells often do not set fruit when temperatures are over 90°F but may begin to set fruit once the weather is cool. Unless the nursery kept them in full sun, harden seedlings off before planting by leaving them out during the day, and then bring them inside next to a sunny window. One hour outside the first day, two hours the second, four hours the third. On the fourth day plant them in the morning. Be sure to water the newly planted seedlings. Put chili plants in the ground when the danger of frost is past. In case a late frost is predicted, be prepared to surround each plant with Wall O' Water or plastic bottles filled with water. Chilies are badly damaged or killed by frost. Place chilies in well-draining soil in raised garden beds or pots with bottoms not resting in saucers. Chilies do not like wet toes. Do not crowd chilies. They should be 18-24" apart in rows 24-36" apart, depending on pod size. In other words, 3-6 square feet is needed per chili plant to at least 2 feet deep. The larger the pod produced by the plant, the more space is required. Bell and Poblano chilies need 6 square feet of space for each plant. When putting seedlings in the ground, remove the entire pot, whether peat moss or plastic. Peat moss pots do not rot in our dry soil and retard root growth, regardless of claims that roots can grow through them. Set seedlings in the ground at the same depth that they were in the pot. Do not place their crowns (stem-root junction) above soil level. Shade new seedlings with 50% shade for the first four days to prevent wilting. After that, provide full sun. Rotate plants yearly so that the same garden bed does not see nightshade family members more than one year in four. This can be done by dividing the garden into four equal quarters. In any one year, three-fourths of your garden should NOT be growing nightshade plants. Nightshade family members include chilies and Bell peppers, tomatoes, tomatillos, eggplants, potatoes, and tobacco. This will discourage the build-up of soil-borne diseases common to nightshades. Use containers only for plants that produce small chili pods such as Chiltepins and ornamentals. The roots of large pod plants need more space than a container can provide. If using containers, the sides should be white or a light color to prevent the sun from baking the roots. Avoid planting chilies near beans, any cabbage family member, or fennel. The roots of these plants produce chemicals in the soil that stunt or harm chilies or vigorously compete for the same nutrients. Good nearby companions for chilies are basil, carrot, geraniums, onion, marjoram, oregano, and parsley. Their aromas deter some insect pests. Allow some of the parsley and basil to flower. This will attract hoverflies which prey on aphids. Because aphids prefer them, geraniums in pots are used as a trap crop, sacrificed to protect chilies and other edibles. Chili plants do best with support. Cylindrical cages with vertical sides made of field fence, or concrete reinforcing mesh, about 19" in diameter and 3 to 4' tall, with 6" long wire spikes on the bottom to anchor them into the soil, are best. Avoid wire supports that are wider at the top than at the bottom. These easily topple over in strong winds. Concrete reinforcing mesh can also be used like a fence. Attach it, or field fencing, to steel T-posts. Tie vines loosely along the fence. Check the ties periodically to ensure stems are not being constricted. Provide full sun in the morning and 50% afternoon shade. Chilies need 6 hours or more of sunlight. However, always provide at least 50% afternoon shade when temperatures are over 90°F. Growers in Phoenix have reported good success growing chilies on the east side of their houses. Experiments have shown that seedlings grown in 50% shade until they were allowed to flower had more fruit per plant, a greater mean weight per fruit, and a much greater total weight of fruit per plant. Chilies are not particularly sensitive to soil acidity, but best results are obtained in the 6.0 to 6.8 pH range. Soils in valleys often range from pH 7.5 to 8.0. Do not use ammonium sulfate to acidify the soil because this is a high nitrogen fertilizer. For further information, see Soil Preparation. Place chilies in raised garden beds or pots with bottoms not resting in saucers. This is the best way to prevent overwatering, especially during heavy rains. Chilies do not like wet toes. Adjust the frequency and amount of watering to rainfall cycles. Do not water if there has just been a heavy downpour. Make sure the rainfall has penetrated deeply and not just wet the surface. A moisture meter purchased on the Internet can help with this. Water consistently to avoid blossom end rot. Use mulch around chili plants to retain soil moisture. During the hottest days of June through August, many plants experience water loss by transpiration [evaporation through their leaves], no matter how wet the ground is. The results are wilting, flower drop, and sometimes even fruit drop. The simplest method of fighting transpiration water loss is to increase the humidity around the plants by wetting thick layers of mulch and by growing in 50% afternoon shade. Chilies are tropical and love high humidity. For chili plants in containers, use a wider than normal saucer filled with small gravel to the brim. Place the pot on top of the gravel and keep water in the saucer at all times to provide humidity around the leaves. The gravel must keep water from entering the pot from the bottom. Water soil and mulch, not leaves, to cut down on bacterial and fungal diseases. Cut off all blossoms for the first six weeks after planting. This forces chili plants to devote their energy to producing more leaves and roots, resulting in larger plants that produce more market-sized fruit. Blossoms do not develop or open in cold temperatures. Wait for warmer weather. In the fall, fewer blossoms are likely as the weather turns cold. If flowers aren't being visited by pollinating insects, several finger taps on the stem just behind the flower will cause pollination. To attract pollinating insects, plant a cluster of marigold, or other brightly colored flowers near, but not necessarily in, the chili garden bed. Also, consider placing a mason bee home in your garden. Instructions for making mason bee homes can be found on the Internet. The key factor affecting fruit set is night temperature, which ideally should be between 65 and 80 degrees F. Pollinated flowers will not set fruit when the temperature is above 86°F at night, because excessive transpiration causes blossom drop. Other causes of blossom drop include excessive nitrogen and high winds. If daytime temperatures exceed 95°F, pollen becomes sterile and fruit set will be reduced. Bell Peppers often do not set fruit when the temperature is over 90°F. Try growing 'Carmen Sweet Pepper' instead. Remove chili pods from the plant with a sharp pair of garden pruners or scissors. Avoid pulling or breaking fruit from the plant, because chili branches are easily damaged. Chilies can be harvested at any time after the fruit have reached the desired size. Flavor, except for sweetness, is not influenced by maturity. Each type of chili has its own set of aromatic substances that give it a unique flavor. Some have more flavor compounds than others. Allowing fruit to ripen on the plant will produce a sweeter taste and higher vitamin content, but may lower total pod production. Chilies do not compete well with weeds. More than 150 types of weeds harbor insect-transmitted viruses that can harm chilies. Weeds also steal nutrients and moisture from the soil. Remove weeds by hand. Avoid tilling the soil. Cutting roots causes slower plant growth, reduced pod production and Blossom End Rot. Herbicides should never be used on plants grown for food. Cutworms, if you have them, can be deterred by placing a paper collar or a 6-inch plastic pot, with the bottom cut out, around the stem and driven into the dirt about one-half inch. Hornworms and other caterpillars need daily inspection. Pick them off if you find them and dump them in soapy water to kill them. For Aphids and other insects, use insecticidal soap or a Habanero chili/garlic spray. Avoid pyrethrum insecticides because they can harm the plant. Aphids can also be washed off with a stream of water from a small garden sprayer. Lacewing insect larvae (ant lions) and Ladybugs can also be used to kill aphids, but avoid all insecticides if they are present. Flea beetles eat small round holes in leaves. There are many species of flea beetle, with potato flea beetles and tobacco flea beetles being the likely culprit for chilies. Organic controls consist of yellow and white sticky traps and diatomaceous earth sprinkled as a dry powder on the plant. Once insects destroy the leaves of a chili plant, the pods will not ripen further. Grasshoppers will eat the flesh of mildly hot chilies such as Mexibell when just the shoulders of the fruit are red. One defense against grasshoppers is to spray the fruit with garlic-pepper solution before the grasshopper has a chance to eat it. This must be re-applied after every rain. A grasshopper control product that contains Nosema locustae protozoa can be purchased online, for use in early summer, on fields surrounding the garden. Birds can be excluded using a cage draped with bird netting. The cage enclosing the chili plant should have vertical sides, be about 19" in diameter, and be 4' high. A garden cage at least 8' wide, 8' high, and 16' long will also keep out birds. Capsaicin, the chemical "heat" in chili, is often measured by Scoville units, originally the proportion of water used to dilute one unit of chili pulp until no heat was detected. Chili pods have evolved to be consumed by birds, not mammals. The heat that bothers mammals does not affect birds because they have no sensory receptors for capsaicin. Chili seeds pass through bird digestive tracts unscathed but are often destroyed by mammalian digestive tracts. Bell chilies always remain mild, even when flesh ripens to red. Mature pods of the non-Bell chilies are more pungent than immature pods. Generally speaking, stressing chili plants increases their pungency. This includes insufficient water and high temperatures during fruit ripening. The most pungent part of the pod is the placental tissue, or cross wall, which holds the seeds and produces capsaicin. The pod is most pungent at the stem end and less so at the blossom end. The seeds themselves are not very hot but may pick up capsaicin during processing. A whitish, tan or translucent area on the fruit, on the side exposed to afternoon sun, caused by excess sunlight and high temperature. Keep pods shaded by the plant's leaves or by afternoon screening. The tissue on the bottom at the opposite side of the stem has a brown discoloration. Spots elongate and become brown to black, dry and leathery. This is blossom-end rot and occurs when the plant is unable to transport calcium through its tissues because of inadequate moisture. The cause is fluctuating soil moisture due to drought, over watering, or root pruning during cultivation. Desert soils have abundant calcium. Consistent watering every morning with the same amount of water, when the soil has not been soaked by rain, prevents the problem. See the section on Flowering and Pollination, above. Immature pods drop off the plant. This is caused by excessive nitrogen, heat stress, or insufficient water. Avoid over fertilizing and under watering. This is caused by small insects like aphids or thrips, or spider mites, sucking the tissue on the underside of the leaf. This causes the leaf to distort and become wavy or dimpled. Aphids can be gotten rid of by spraying a mild insecticidal soap solution. Another solution is to use predatory insects such as ladybugs, green lacewings, or Phytoseiulus persimilis which attacks spider mites. Chili plants will stay small if they are placed too close together or too close to other large plants, such as tomatoes. Chili plant roots, depending upon pod size, need 3-6 square feet of space to grow. Chili pods need warm temperatures, a bit of direct sunlight and time to turn red. By the start of fall, nighttime temperatures are lower and there are fewer hours of daylight. From this point on, pods may stop turning red quickly and must be left on the plant much longer or be harvested green. If a pod has even a small red spot, however, it can be placed in a bowl with apples or bananas and finish turning red. * Poblano is known as Ancho when dried. ** Smoke-dried Jalapeno is known as Chipotle. *** Chiltepin is a wild chili native to the southwest desert.